Goodbye Buffalo, Hello San Antonio! There’s a reason I haven’t posted lately, I swear! I’m no longer a Buffalonian. In a short time period, I’ve relocated to San Antonio, Texas. There are many new opportunities facing me both professionally and personally that I’m filled with excitement and gratitude from. 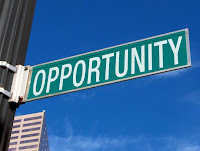 Life is about opportunity. It knocks everyday. It can sometimes be a gut instinct, sometimes impulsive. The difference between those who are “lucky” and those who aren’t, is that the “lucky” ones, give in to that instinct. They see it, they take it. Scary? Sometimes. Risky? Of course. But I’ve taken my opportunity and embraced the crazy. Last night, my alma mater SHRM chapter at University at Buffalo had their first executive board meeting. They are off to an exciting year. They began finalizing guest speakers, topics and events in August so they are well on their way to a successful semester. I have a particular fondness for this club, as I acted as Chapter Liaison and President my junior and senior years, respectively. We had challenges that first year. The last eboard left $0 in the treasury, no keys to the office, no way to access the UB domain club site and ... no members. We had to wing it. We had no local SHRM Chapter Advisor and a faculty advisor who openly took the "hands off" approach. We were 4 HR students, with relatively little HR experience, coursework or leadership guidance. It was hard. This year, I have decided to dedicate myself to the club and students from a professional perspective. There are a few tricks I've learned over the years and I want to encourage their success. I'm going to be conducting leadership training for their executive board this year. I have been debating between a Franklin Covey Focus type course or a team building day. They are putting in their hours for this club and I think they should get a few fun perks out of the deal as well. The assigned UB domain site is not user friendly. They have to rely on connecting with an MIS student who will be available to continously update the site. It doesn't always work out well. Working with them, we will create a user friendly site outside the UB domain, perhaps on a blogging platform, that they can easily update and create an online club community on. Along with that ... social media training! There are some valuable HR resources out there I wish I would have known about when I was graduating. Do you want to get involved with local college SHRM chapters? They are all listed on the SHRM website, with their faculty advisor. Most local professional chapters have liaisons that deal with the college chapters, but my best advice would be to contact the faculty professor who is mentoring the group. It will get you quick easy access to them. The hardest thing to see while at college was the lack of students willing to participate in something that might help shape their future. The lure of a night at the bar, a movie or naps were much too tempting. So what can we do to change this? Get involved. Help them. Provide value. The students are up and off to their first semester .... give them a call! I recently stumbled upon a blog by my friend Andrea Michnik who, among many other things, blogs for Stratejoy. Stratejoy is a website dedicated to women going through a “Quarter Life Crisis”. It’s a great site and the women who blog are truly inspiring. One of Andrea’s blogs was titled “30 Things to do Before I'm 30”. I really like the idea because I’m always adding things to my mental list. Without seeing them written and having an action plan, they probably won't happen. However, It could be looked at 2 ways. What do I want to accomplish before I’m 30? But also, what cool things have I ALREADY accomplished? So I’ve started 2 lists. The first is Cool Things I’ve Already Done” because sometimes it’s easy to forget them! The second is the starting of my Things to do before I’m 30. Hopefully by the time I reach 30, they will have all been transferred to my “Cool things I’ve already done” list. Do you have any? Share them with me! 13,000 feet in the air, my leg dangling out the door, it hit me that I was about to fling myself out of a plane. Before my mind had time to process any fear, my instructor had pushed us out of the opening. As a gift a few months back, my Dad gave me a GPS. I am not one for directions and GPS’s annoy me, especially that voice saying “turn left now” 5 times in a row. I asked him to return it and decided we would go on an adventure. First, we played with the idea of a Nascar Driving Experience. Unfortunately, there isn’t one located in Buffalo. Finally, we settled on Skydiving. We found a great local place in Newfane, Frontier Skydivers. The atmosphere and people were … well, fantastic. What a life they lead! Many of them have rearranged their lives to revolve around the next jump. Work during the day, jump in the afternoon, relax with beer and friends at night. Relaxed and completely centered around catching that next adrenaline rush. 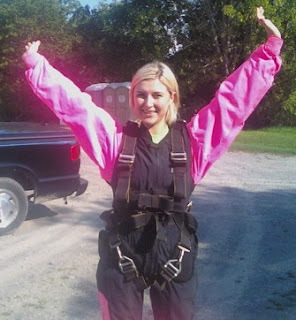 Suited up in my pink parachute outfit, I was ready to go. My instructor, Larry, was exactly what I needed. He explained the important stuff and didn’t get caught up in the detail. More of a “go with the flow” kinda guy, much like me. I didn’t want to ask questions or get bombarded with detail … I wanted to jump! One at a time, the single jumpers fell out of the plane until finally, Larry & I were left. Left leg first, right leg underneath and suddenly I was sitting out the door of a plane. What a rush! We did a few flips in the air then evened out … free falling at 120 mph for 60 seconds. It felt like we were floating. He gave me the signal to pull the ripcord and we were suddenly flung back into the air as the parachute opened. The cool part was that there are handles attached to the parachute which enables you to direct where you go. Pull down on one side for a few seconds and you start spinning in circles. It was an experience like no other. I will be chasing that high always! I can’t wait to go back and am determined to take training classes to receive my license to jump solo. Even if you’re not the adventurous type … live outside the box! Do something a little different – and this is DEFINITELY something everyone should do. I don’t believe in regret. Despite all of the silly, stupid, senseless things I may have done (and will probably do) in my life, I refuse to let regret rule my emotions. However, there is one thing I do regret … and it haunts me everyday. The summer before my junior year of High School, my Mother was diagnosed with Colon Cancer. This also happened to be the same summer my teenage rebellious streak hit full force. I spent the summer and much of the school year sneaking out of the house, stealing the family van and in detention … or suspension. I cut class, lied, fought with my family and talked back to everyone and anyone. I took advantage of the state my Mother was in. Even as I write this now, I am fighting back tears because it’s the one thing I hate about myself. I snuck out when she was too weak to come after me because of chemotherapy. When she tried to discipline me, I told her I hated her. She had CANCER. I can’t believe I am admitting this to the world. Years later, my Mother is my best friend. Despite how I acted, she fought to bring me back to the person she knew I was and could be. She beat her cancer and she helped me fight inner demons at the same time. She is the strongest, most inspirational person that I know. No matter what life throws at her, she bounces back with a smile and spring in her step. I look to her for advice on almost everything, even though I don’t always want to listen. I couldn’t imagine living life without her by my side and on my team. Mom, I love you. I’m so sorry. Thank you for being my real life superhero. Cancer is something that we are all affected by in one way or another. I full heartedly support any fundraisers that come my way surrounding this subject. Roswell Park Cancer Institute is doing wonderful things here in Buffalo, NY and they could not continue without the support of our community. Currently, they are halfway to their goal of $8,000. Please read her story here and consider donating to this wonderful cause. Her team is also raffling off Buffalo Bills tickets to raise money! Click here for more information and the chance to win! Even if you don’t win the tickets, you are helping win the fight against cancer. One of out three American’s will be diagnosed with cancer sometime in their life. Let’s work together and fight for a cure! One of my favorite movies of all time is Pay It Forward. Besides starring little cutie Haley Joel Osment, the concept it surrounds is fantastic. His character is working hard to make the world a better place. The idea? What would happen if 3 people were given a favor and, instead of paying it back, they paid it forward? Throughout the movie, he engages in 3 random acts of kindness and asks that in return, they do the same to others. A moving idea. Ever since seeing this movie, I try to actively pay it forward. It might happen only once a month, or as often as 3 times a week. It can be as simple as sending someone a message that you're thinking of them. Yesterday, I had my first encounter with the ice cream truck. Growing up in the country, I never had such a wonderful thing before! I heard it coming and got so excited I ran out to the street in barefeet. There was a little girl who was trying to buy a bubblegum popsicle. It was $1.50 but she only had .75 cents. I bought it for her and told her to put her .75 cents in a piggy bank. The smile on her face was worth much more than the $1.50 I spent. It's great to receive something unexpected. It lifts spirits and renews hope. Well, these things don't just happen! I am challenging all of you to begin actively engaging in the concept of paying it forward. 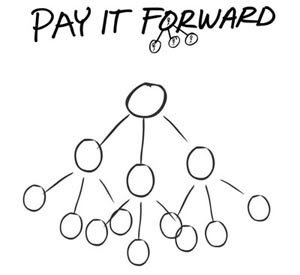 How will you pay it forward? Let me know!